This beautiful, funny, sorrowful book is an impressively assured debut. Drawing on the realities of the modern day health services from the point of view of a ‘service user’, Nathan Filer has woven a tale of sibling love, family grief and mental disintegration that begins with a funeral for a doll at a Dorset campsite. Filer has been interviewed extensively about the Costa Award-winning book, and is open about the influence of his work as a mental health nurse in creating the world of 19-year-old schizophrenic Matthew Homes. Strikingly, however, he has dug deep in Matt’s state of mind and has devised a variety of means to immerse us in it, including sketches, typefaces and, always, a heart-achingly upfront voice. 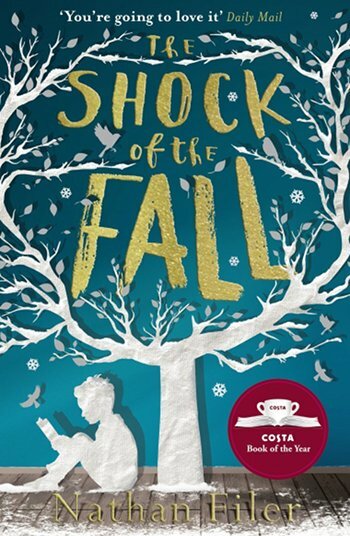 Three truly beautiful books – The Shock of the Fall by Nathan Filer, The Children’s Book by AS Byatt and Neil Gaiman’s The Ocean at The End of the Lane. And I am in bookworm heaven. Here’s why. These three books, while utterly exquisite reads in their own right, meld together in extraordinarily flavoursome ways. Think of the fresh deliciousness of ice-cold tonic, then imagine adding in a generous splash of gin followed by a fat wedge of lime. See what I mean? For starters, they each have a glorious cover in shades of blue, just the thing to lift me out of February’s traditional gloom. The glints of gold and light enhance the blue, and the fact AS Byatt’s tome features a gorgeous yet monstrous dragonfly woman makes me immediately want to know more. Secondly, they each weave fairytales into their narratives – or at last otherworldly elements, some imagined, and some apparently real, at least in the world of their narratives. Thirdly, each tale centres on a strong, introverted protagonist with a rich inner life – whether they’re the narrator themselves or simply one of the many characters, but each offering a sharp-sighted gaze on the events unfolding. And finally, for now at least, each of these skilfully written novels intersperses passages of sheer, startling beauty with moments of fear and dread, bringing together poetry and horror fit to take your breath away. Wonderful.